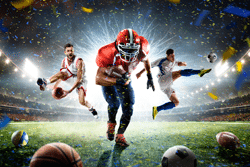 With the Super Bowl and the Olympics right around the corner, there’s no better time to talk about how sports marketers can tap into some of the major trends affecting sports. Smart stadiums, big-time fan engagement and an increase in the number of women participating in sports (and being fans) are a few trends impacting the sports industry worth between $500 and $600 billion worldwide, Forbes says. The costs are going down and the benefits are going up. Sports fans want more video and they want it on demand to watch when they want to. They want to go behind the scenes, watch interviews with elite athletes, catch up on amazing plays and get a look inside the locker room. The Council recommends launching your own OTT (over-the-top content) platform, so you can tap monetization models. Sports fans are die-hard loyalists. Many stick with their favorite teams for life. That’s a boon to sports marketers that can tap that loyalty via ecommerce. Customers are already engaged. Use the massive amounts of data gathered to “carefully” target consumers who willingly handed over their personal information in exchange for targeted content, the Council said. As the term “people-based marketing” moves into the mainstream, sports marketers can use surveys to fine-tune personalized marketing. Incentivized surveys can turn up fans strong opinions and can help marketers deliver useful, relevant content.